Our services include major repairs of Crankshaft, Engine Block, Connecting Rods, Cylinder Heads, overhauling, rebuilds and other tasks, which are essential for the maintenance ofMarine Diesel Engines, industrial diesel engine and Generators. We specialize in providing on & off-site Diesel Engine repair & overhauling services for Industrial and Marine Diesel Engines. We also undertake major repairs of Crankshaft, Engine Block, Connecting Rods, Cylinder Heads, Metal Stitching, overhauling and other tasks, which are essential for the maintenance of Marine Diesel Engines and Generators. All Diesel Engine Overhauling follow a standard procedure of - dismantling, inspection, Reconditioning & assembly of the engine as per respective manufacturer's recommendations. We have team of qualified engineers retired from Shipping, Indian Navy and Industries. We also have on our panel engineers from the engine manufacturers of British and German origin. Our diesel engine repair services include overhaul, maintenance, repairs for low and medium-speed marine and industrial diesel engines and turbochargers, Governor as well as spare parts supply. We specialize in providing on & off-site repair & troubleshooting services for Industrial and Marine Diesel Engines. Our services include major repairs of Crankshaft, Engine Block, Connecting Rods, Cylinder Heads, overhauling, rebuilds and other tasks, which are essential for the maintenance of Marine Diesel Engines and Generators. 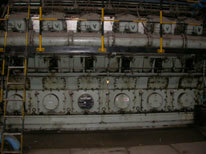 We also undertake Shifting from on site to another, Erection and Commissioning of Diesel Engine. All repairs follow a standard procedure of - dismantling, chemical cleaning, inspection, Reconditioning & assembly of the engine as per respective manufacturer's recommendations. We have team of qualified engineers retired from Shipping, Indian Navy and Industries having experience over three decades. We also have on our panel engineers from the engine manufacturers of British and German origin. 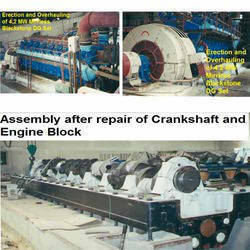 Our organization provides complete Marine, Industrial Engine and Spare Parts. We have association with ship breaking companies in Alang based in West Coast of India and Bangladesh. Being an engineering company, we ensure that engine and the spare parts offered by us are thoroughly inspected at our premises before the final delivery of consignments. We also submit the report, which covers the information of all the major subassemblies, which is supported with photographs to help our clients choose the correct spare parts. : Revolutionary, portable and easy to operate onsite crankshaft grinding machine is manufactured up to 700 mm. No need of sending the crankshaft to the workshop for repair. The crankshaft grinding machine is designed to undertake grinding of crank shaft without removing of crankshaft from the engine block. Crankshaft grinding machine is low in price and is highly recommended for repair workshop, power plants and shipping companies.